Incidentally, I read Morgan Freeman’s aura five years ago, one of our aura reading movie reviews. With 38 of them done so far, this type of energetic literacy research is such fun for us movie fans who want to know more, more, more. A newspaper article where, surprise! This beloved actor calls for legislation across the board for legalizing marijuana. Did you know, he has been smoking weed regularly since the marriage to his first wife. (Whom he married in 1967.) I had no idea that Morgan Freeman was a pot smoker, but found this out today while seeking a current photo. Morgan Freeman told “The Guardian” he has used grass regularly, way long before he began using it for pain control starting in 2008. Smoking weed is something entirely different from a civil liberty. Okaaaaaay. This will be a different kind of aura reading than I was expecting. Maybe you, too, MADALENA LEMOS and other Blog-Buddies. As a treat for all you aura readers with sophistication, today I’ll research six !!!!!! chakra databanks that I have never read before at this blog. Deep space. Very identified with a beautiful pot high, an astral level of experience that feels so good, loaded with celestial beauty. It’s a mellow sense of self, very connected with all that is. As such, Morgan Freeman’s concerns about receiving respect from anyone… are minimal. He feels fine with whatever happens. Nothing can bother him. Sounds great. But what’s missing here? Human identification with a sense of self, the basis for free will. Having a substance-free, human-centered identity is a prerequisite for moving forward rapidly on a path to Enlightenment… or any other version of personal development that might be your highest ideal. Using weed for a shortcut can appear to successfully game the system. Grass provides an instant, effortlessly-high, state of consciousness. You could say that subtle problem, hidden in the human energy field, is understandable. Why? Karma comes back to us from all that we say or do. And a cannabis-user’s high hasn’t been earned. More consequences of regular pot indulgence may come up later in this article. Morgan Freeman is so beloved for his work as an actor. That glorious voice, his expressive eyes, that handsome face, a regal bearing — all of this shows right on the surface. Here we’re simply exploring a subconscious-level chakra databank, at the astral (or psychic) level within Morgan Freeman’s aura. Out to the stars. A total flow. Beautiful surrender. To a fellow pot enthusiast, this might seem like the ultimate in goodness. To this Enlightenment Coach, what I find here is very disappointing. The human component is absent for Morgan Freeman at the time of this photo. Human-based spirituality is such a privilege for all of us living today. If we can manage it, during these early years of the Age of Aquarius, we can progress so rapidly in our spiritual evolution, glorifying what is human. Seems to me, advocates for cannabis are missing the point of a precious human incarnation. After this lifetime is over, each of us will be in a body of light. We can go to our next heaven, that celestial loka appropriate for our level of consciousness. But that time is not now. Yet one more reason for not smoking grass. IMO. Because when you’re back to being a soul, not incarnated, you won’t ever have again the opportunity for making the most of THIS Magnificent Human Incarnation. 5 inches. Morgan Freeman may be very expanded in his sense of self, consequences of identifying with astral life rather than human-level frequencies — i.e., The typical astralish sense of identity for anyone strongly influenced by marijuana. Yet human likes, dislikes, and needs can do the equivalent of snapping an expanded rubber band back down to small size. Pronto. Definitely. And with a very human kind of sting. 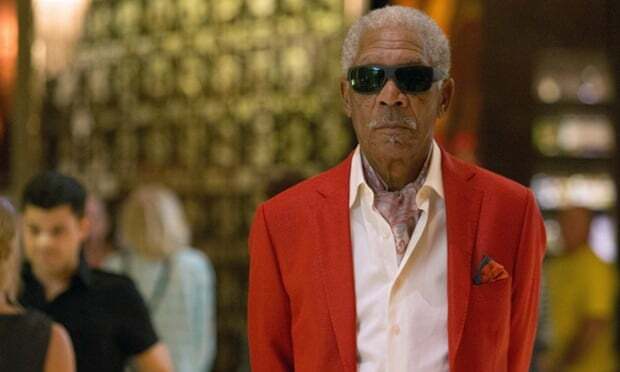 For Morgan Freeman, a great deal of STUFF is clustered around his sense of fairness. The patterns involve feeling that HE has not been treated fairly, has not yet received his due. Notice, Blog-Buddies? This is the first human-feeling chakra databank I have researched on him yet. The quality of this chakra databank (at the time of this photo) involves counting, evaluating how well he is being treated this time, deciding whether or not the current treatment of him is fair — all so very human, you know? Resentment is the bottom line. And all the fame (or cannabis-induced bliss) cannot alter this subconscious kind of vexation. 5 inches. “I give when I choose to, not when you demand it.” That’s the subconscious and energetic balancing act from a performer who has been an A-Lister since when, 1989? STUFF in this chakra databank includes more resentment, as if Morgan Freeman is often asked to give and give and give. Personally, I can’t imagine what it is like to be that famous. And for that long. Can you? Blog-Buddies, this is one of Morgan Freeman’s optional chakra databanks; each of us has a few in each set of 50 chakra databanks per chakra. Fills the room plus two inches. Stately, even regal. Huge gravitas. Persuasive in a way that elevates the listener or viewer. Whatever kinds of STUFF clog up Morgan Freeman’s aura, and however the use of weed has distorted his auric modeling, this chakra databank remains pristine. And isn’t this why we love Morgan Freeman? It’s true for each of us, spiritually: Being a unique soul, a magnificent expression of Divinity, and worthy of awe. Just like those concentrated wads of etheric splendor, Divine Beings — such as God or Jesus or Buddha or Kwan Yin — being so very worthy of awe. And maybe this is what MADALENA LEMOS was loving most about her grandfather, that hidden and delectable secret beneath the surface. For sure, while we live here, evolving at Earth School, human life isn’t mainly about divine but about human. And therein lies such poignant tragedy, along with the rest of our compulsory education. It’s so refreshing to encounter Morgan Freeman’s reminder of personal magnificence, effortless, his kind of who-you-be. Blog-Buddies, I am very curious to read this chakra databank on Morgan Freeman. I’ll tell you why. Since he has gone public about the use of marijuana, I’d like to read this part of an aura that cannot lie or be influenced by the stinkin’ thinkin’ of a substance user. High = connected to God. Or that high = spiritual superiority. Or that high = spiritual growth. Let’s check out this chakra databank right now, okay? 1/8 inch. Yes, at the time of this photo, Morgan Freeman’s Spiritual Growth Chakra Databank is flatlining. Of course it can always come back. Nothing destroys a chakra databank, nothing short of death. However, at the time of this photograph, this Third Eye Chakra Databank for Spiritual Growth is numbed out and, mostly, stuck in — What else? Anger, blaming, resentment. Morgan Freeman is a beautiful being, with larger-than-life talent and huge karma for fame and popularity. His greatest gift, in every role, may be that auric modeling of charisma, reminding each of us that we have essential dignity, grace, importance, even splendor…. spiritually. Knowing about the role of pot in his life explains a lot about what I read here today. Also why he scored so poorly in the Aura Reading Movie Review that I did for his last Oscar nomination, nine years ago. It would appear that what keeps bringing Morgan Freeman back to paying attention to human life is…. And if I’m right, thank God for those feelings. Although unpleasant, they keep Morgan Freeman paying attention to human life. More than if this wasn’t happening at all, on that astral and subconscious level. So much that’s human isn’t what it seems. Bring on the energetic literacy! Here is a smaller, saved version of that same aura photo. Skills for depth aura reading are so important for the healing techniques of Rosetree Energy Spirituality. Of course you can develop this skill. If you can read these words on a screen, you can learn read auras fluently and accurately. In person. From a photo. Or using Tinder or Facebook or any photograph on a screen like this one. Thank you. Your blog is always a fascinating read. Aw,thanks CURIOUSER AND CURIOUSER (AS EVER). As for you, MADALENA LEMOS, inspirer of this whole blog post, you asked a GREAT question. Thank you, too. I’ll do one main point per comment. In my understanding, at least, MADALENA, a trait is about heredity. Heredity has zero relevance to what you find in any chakra databank. There is so much technical information in this field of Energy Spirituality. I’ve grown used to it, year by year. Kind of like carrying around your little baby. By the time your baby is five, she’s heavier than she used to be. Your muscles have gradually developed, though, so she might not feel all that heavy to you. Any time I do not explain a blog post clearly enough, I need you’all to remind me to define some of the terms being used. A gift of your soul. This is your personal knack for doing that particular aspect of life. Each gift of your soul is permanent, like a fingerprint. You can’t mess it up. This is at the Divine level within you. Or Morgan Freeman. It’s permanent but who would want it to change, since it cannot be improved? Then there is the Business End of a chakra databank. This varies all the time, since this part of a chakra databank is at the astral level. So it is always changing. Problems show here, whether that chakra databank is under-functioning or over-functioning or doing well. Of course, this can be helped. Morgan Freeman, anyone, can move out the STUFF from smoking all that pot, for instance. It’s way more cost-effective to not pay for the pot in the first place, because expert help is needed for those sessions — and one is pretty much guaranteed that every joint (or the equivalent for another optional drug) will deposit major STUFF in one’s energy field. Prevention is the best medicine, right? What a fascinating aura reading, Rose. And I am always appreciative when you read new-to-me chakra databanks! dear Rose, I am in fact new to this concept of chakra databanks but they are getting clear for me. The fingerprint image is what I like the most, and in that sense let me explain better my question. We all are unique, a single combination of genes and have a unique soul, correct? That gives us different perceptions and reactions to the events throughout life. One way or the other, I believe they will always mirror the soul within us. However, sometimes, same way as we can get a scar in our finger that changes the fingerprints for life, or a genetic mutation, will our soul change its mind? I ask this as I feel it is happening with me (curiously my skin does not heal properly too). After a particular hard period in my life I feel like the way I see things on a core level has changed deeply, and that changed a lot of other behaviors in me. And I feel great about it. Now I do not now if that is evolving, discovering myself, or just some kind of illusion that will fade once harsh times hit again. This is not my native language, though it made sense.. thank you for all your comments! Blog-Buddies, this morning one of the members of the Facebook group “Empath Empowerment Skills” announced it has now been 19 days since he stopped smoking pot. Can it be done? Definitely! MADALENA, what I wrote in the previous comment is the short answer to your question. You described your experience beautifully from the human perspective. But there is another perspective, that of Deeper Perception, using energetic literacy. And, of course, that’s what this blog and my website are all about. From this perspective, we can have problem energies that get stuck in our auras, happening at a level that is subconscious and, therefore, hidden from our conscious understanding. In a clear way. Our motto is that STUFF can always, always, always be healed. After this happen, we can live much more as wel like. As in the case of that fellow referred to today in Comment 15. Of course, one doesn’t have to have sessions, or learn skills of energetic literacy, in order to progress as a soul. From your comments, MADALENA, it sounds as though you have been doing just that. So you might like to learn about the concept we use here, in energy spirituality, called VIRTUAL REINCARNATION. That link might help you to better appreciate what has been happening with you. Rose thank you for this aura reading. People are so interesting. The most interesting thing for me. I’ve been wondering something for a little while. Some of his databanks go to deep space or out to the stars. But the quality is astral, is the impression I am getting, not divine.. ? And I thought ‘out to the moon’ meant astral, and out to the stars meant divine, in your descriptions (I also saw Lena Durham had this). I am misunderstanding the terminology, but I don’t want to be a nitpicker cause I do get the reading as a whole. LARA, you do get this. You have asked a superb question. It can still be astral, when chakra databanks go out to the stars now. Depends. NOW is the important word here. Some of you more sophisticated, long-time readers of this blog (like LARA) may know that occasionally I make reference to extreme spiritual addiction and the virus-ey cords of attachment that folks have to public figures (and others) who are very, very much sharing their lives with astral beings. Rather than having the normal human experience of your human soul in charge, free will and all. For people who are caught up in that virus-ey situation with extreme spiritual addiction. Or folks who actively are leading this sort of pattern in themselves and others. By now there can be extremely large sizes to chakra databanks, reflecting that intense astral involvement. Bottom line, LARA: Divine and astral frequencies are still way different from each other. Divine is still a better use of one’s precious human time. And Divine is the name of the game called “Enlightenment” — as you, LARA, know quite personally. So thanks again for asking your very astute question. Wow, we’re just seven comments away from 23,000 comments here at the blog! Thanks to all of you who are actively making this such a lively, sweet, smart, and caring community. Aha! Ok I get it now Rose, thank you for explaining! An interesting study in contrasts. Mr easy, yet that resentment, and that charisma. Seems he has a great opportunity for fast growth but is spending it instead in avoidance. I also find it puzzling. People who would never consider smoking filtered cigarettes somehow see it OK, even medicine, to smoke unfiltered pot. Pot that doesn’t have the same standards of quality as tobacco – like pesticide residues, fillers, etc. Not to mention that most of it supports gangs. And all that evidence for health issues with smoking? Heart disease, cancer, etc etc. Would smoking something different really make so much difference? My own experience has been that people with a history of pot have the foggiest experiences on spiritual retreats. Just something else that has to be healed. Yes indeed, DAVID. Every pot high puts in at least one frozen block, and other STUFF can be involved as well. That STUFF can always, always, always be healed — of course. Still, I wonder how long it will be before mainstream medicine recognizes all this. In his interview with “The Guardian” (that I linked to at the start of this post), Morgan Freeman explained why he uses marijuana for pain control. He said that nothing else worked as well. Of course, since he had been smoking weed for many decades, this doesn’t surprise me. Because long-term cannabis use results in identifying with an astral body, not one’s human body. This reminds of a story I watched on 60 minutes not too long ago that was about medical marijuana growers in the state of Colorado. I watched it with my empath gifts off, and I simply paid attention to what people who were featured said and did rather than doing any kind of aura reading or other techniques. Of course, I still picked up on people’s auric modeling, and the word that kept running through my mind was FRIED. Not only did these people involved with “medical” marijuana seem FRIED, they looked it also. I am often tempted to ask such people if they ever look at each other and wonder if they are supposed to look the way they do (drugged out). I know that they likely never do that since people are usually interested in people with auric modeling similar to their own, but I still find mind blowing how totally oblivious people are the effects of many drugs. David’s comment (28) reminds me of some vegetarians who get highly annoyed, hostile even, if their food isn’t cooked in a pure vegetarian kitchen. But, my oh my, how they love their ‘drink’. One of the things that I have noticed lately, is that just about every romantic movie has a scene where the characters smoke pot together to lose their inhibitions and get close, and just about every young adult book I’ve read lately has had that same scene. It’s almost becoming obligatory. When I was in college, I thought there was something wrong with me because I didn’t enjoy the experience. I’m really glad that you have called attention to this issue in your blog. I’ve noticed that, too, Kylie, (about marijuana and other drugs featured in popular media) and there are never any unpleasant consequences written into the script. People who look to television and books to decide what’s “normal” are getting some skewed messages. Ah, earth school. JESSICA and KYLIE and DEVON, thank you so much for these important counter-culture comments. When police officers, lawyers, psychologists and others are using skills of energetic literacy, we can expect collective consciousness to shift. Yet one more reason, in my view, to consider aura reading a survival skill in this Age of Aquarius. I have only ever been “high” from marijuana once, and boy was it the most unpleasant experience of my life. Hah. My companions seemed more okay with things. And I didn’t feel very lucky at the time (more like “terrified” or “very upset” or “like I might be about to die and that would be okay”), but BOY OH BOY do I feel lucky now! I find it really fascinating that Morgan Freeman (or anyone!) can still have such success in a worldly way without even really being here to experience it. There sure is a lot to learn about what makes people tick!! 🙂 And a lot of different ways to have an interesting human life, I guess. This recent stream of comments reminded me of comments made by our level-headed governor here in California, Jerry Brown. On the topic of legalizing marijuana, he raised concerns about things possibly going too far, questioning the wisdom of having so many people stoned when we especially need to be alert in this competitive world we live in. Good point, IMO, and something I’ve often wondered about lately. Hasn’t anyone thought about all the flaky things that all those happily stoned people might do? Thanks for your read on Morgan. I have always felt he was very laid back and non-conforming. His voice had such clarity when narrating for the penguins that charisma you write of above. I found it interesting that he was paid $21 million to ‘talk’ for the penguins. Enjoyable newsletter, Rose, I posted my joy about it on my Facebook page. Ha, ELIZABETH, non-conforming he is. I’m so glad you’re sharing about these skills on FB. For blog posts, I think there are little icons at the bottom of each one so you can directly share there, which would be very appreciated. All of this spreads by word of mouth, from people like you. Even if you won’t be paid $21 mil for the good deed.